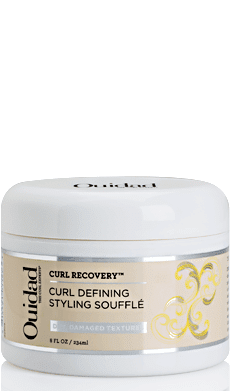 Ouidad's new Curl Defining Styling Soufflé is just what curly or wavy girls need to quickly hydrate and refine/elongate the curl pattern, while also taming frizz and adding add day moisture. As you'll see in a moment though, this product is also versatile for those of you who have relaxed and natural hair as well. Used on loosely curly or wavy hair that is dry, the best way to use this product is on slightly damp (misted or freshly washed) hair. Then use about a nickel to quarter-sized amount and spread first though the palms of your hands - this is important to avoid using too much product or having an uneven amount in certain areas of the hair. Then spread throughout hair, concentrating on the ends if your ends are very dry/frizzy. If you have more tightly coiled curls, the same steps apply, but you may need to adjust the amount of product that you use. The next step is to simply gently finger comb and shake hair to reset your curl/wave pattern. This product contains Mafura Butter and Kalahari Melon Seed Oil for rebuilding, nourishing and protecting hair. It also has natural emollient oils from Avocado, Radish, Coconut and Meadowfoam. It also contains a cuticle smoothing polymer which helps define curls/waves and keep curls from frizzing - but without a stiff or crunchy hold. The texture of the cream is very whipped and airy, but does have a lot of slip to it which makes it easy to work into hair. It's lightweight in feel and has a slightly sweet, cocoa butter based scent which is also very pleasant and dissipates over time as well. *This product was provided courtesy of Ouidad PR for reviewing purposes.